Coat a 9x15-inch glass baking pan with no-stick cooking spray. Separate the egg whites from the yolks. Beat the egg whites with an electric mixer at high speed just until they form stiff peaks. Set aside. In a medium-sized bowl, beat the yolks and the sugar with an electric mixer for 10 minutes, or until the mix becomes light yellow and creamy. Add the vanilla. Add the flour gradually. Mix until everything has been well integrated. With the help of a wooden spoon, combine the egg whites and the flour mix. Fold the mix until everything has been well integrated. Bake for 20-25 minutes, or until golden brown. You'll know it's ready when you stick a toothpick in the middle and it comes out clean. Remove from the oven and, with a fork, poke the cake on all sides to help it to better absorb the milk. Allow to cool for about 5 minutes. Blend the strawberry-flavored milk, condensed milk, evaporated milk, and the table cream in a blender. Pour this mix over the warm cake. Cover with plastic wrap and refrigerate for 1 hour. Remove the cake from the refrigerator, spread the whipped cream on top, and decorate with the fresh strawberries. Use regular milk if you don't have strawberry-flavored milk. 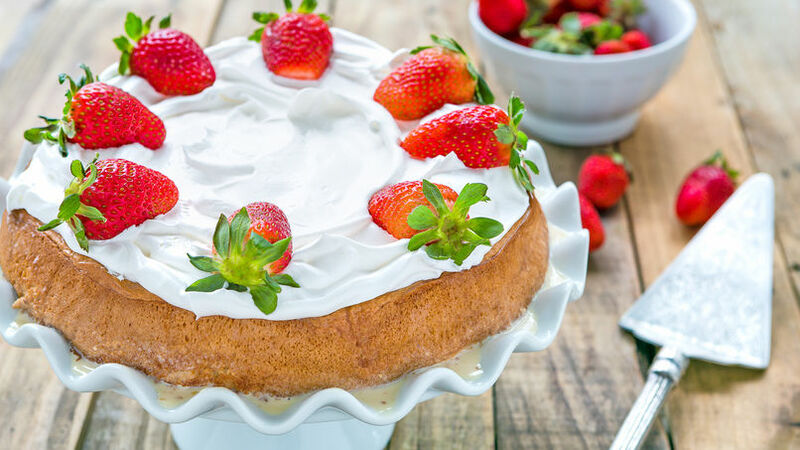 You're going to love this version of the famous Tres Leches ("Three Milks") cake, with strawberries! The following is my recipe for a traditional tres leches cake, with some small changes. First, use strawberry-flavored milk, instead of regular milk, to give it an extra-special touch. I substituted meringue for whipped cream because, in my opinion, it goes better with the fresh strawberries. The end result is a heavenly cake that's both creamy and refreshing... It's truly irresistible!